Which Costs More to Install? Let’s look at a 30′ x 30′ garage for an example. But before we go any further, let’s just clarify that the example and prices are not meant to be an official quote. The numbers in our example are for informational purposes only, but are accurate to the best of our knowledge. Every project is different. Rest assured we have a dedicated and knowledgeable team that would be happy to get you a custom quote. 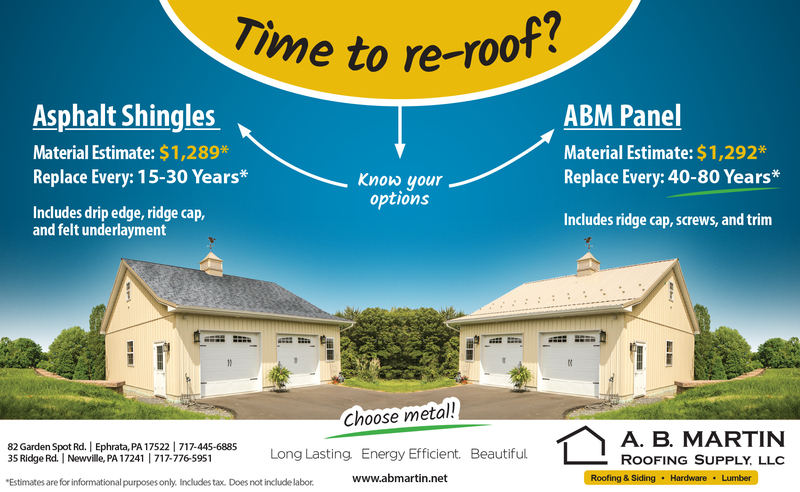 On the surface, an asphalt shingle roof is the slim winner at $1,289 versus $1,292 for an ABM Panel metal roof (Includes tax, but does not include labor). But if you look at the bigger picture, metal is the obvious choice. The Asphalt Roofing Manufacturers Association states on their website, “If a residential roof is more than 20 years old, it is a prime candidate for reroofing.” Compare that to our ABM Panel that comes with 40-year paint warranty. There is no question that a metal roof can stand the test of time better than asphalt shingles in most situations, and contractors will tell you that there is very little keeping a properly maintained metal roof from lasting over 100 years (especially if it is a hidden fastener panel like our ABSeam Panel). Metal lasts longer, is more energy efficient, is more beautiful, and can cost about the same as asphalt shingles. An additional cost you may incur that is not reflected in the quote would be the removing and disposing of old shingles if replacing them with more asphalt shingles. Since metal can be installed over top of an asphalt shingle roof (see local building codes for possible weight limitations), you’ll save labor and disposing costs, but keep in mind you will have to buy and install wood purlins (we recommend 1×4 pine spaced 2′ on center) to provide an even base for the metal panels. So the cost might still be a wash.
Also, the cost will be affected by the complexity of the roof. If it is a simple roof with few or no valleys, metal panels may be significantly cheaper and faster to install than asphalt shingles (including labor). But if the roof is more complex with several valleys and peaks, though the material costs might still be about the same, asphalt shingles are going to install faster and cost less in labor than metal panels. That said, it is still hard to beat the long term savings of a metal roof.